I finished reading this complete series some time ago, and enjoyed each and every book, immensely!!! Sometimes you just hate to leave a character who worms his way into your subconscious: insisting/urging you to read on to discover his fate. 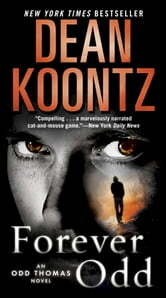 Dean Koontz is one of my favorite authors,; amongst an eclectic group of writers. I am never bored, and finishing a book comes all too soon. I highly recommend this series. I really like this series. This is the 2nd book in the Odd Thomas books. This series is all about good vs evil and the price that sometimes has to be paid for good to win. Thomas is such a good soul!! I don't usually like books like these because they can make me cry which I hate, I'm not one of those people that likes a good cry every once in a while I just feel sad and tired!! This series is the exception. I'm a huge Dean Koontz fan from way back and this series doesn't appear to change that. Happy reading. Once again DO paints a story that takes you on a ride with a most lovable character and his witty sense of humor. I just want more. Not as good as the first one but still a good read, love Odd, would like to continue reading the series.